As a general rule of thumb, the movie buff is wise to plead ignorance on most things associated with 80s movie fantasy. Widely seen as the decade of origin for this cinematic subgenre, the results were often coarse and uneven, limited not just by over experimental (and overzealous) writing but also by technical limitations that often clashed with the entire purpose of fantasy, which is to be taken to places beyond the wildest in imagination. Some attempts were of ample satisfaction (“Willow” and “Ladyhawke”), others just plain mediocre (“Labyrinth”) or, worse, ridiculous (“Legend”). John Boorman’s “Excalibur” was the only of its kind to break free of those chains and remains the defining spectacle of that time, but, perhaps, not widely accepted as such since its source material is rooted less in pure fantasy and more in literary legend. 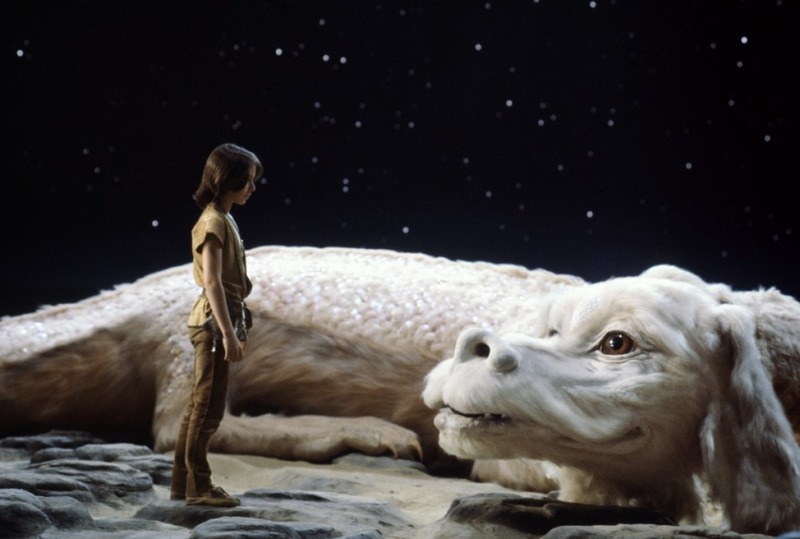 For the more puritan perspective on acceptable film fantasy from that era, Wolfgang Petersen’s “The NeverEnding Story” is the crown jewel. And that is not by just sheer comparison, either; ambitious and wistful, the movie was, we suspect, made from an instinctual gusto of an assemblage of eager filmmakers, who looked through a camera lens and saw something more unforgettable than anyone could have anticipated. For young audiences, it also marked an immense departure from the surface fodder of other pictures geared towards children and teenagers; whereas some of our earliest memories of movies can often be summed up in general statements about bright visuals, loud music or blatant sight gags, here was a little adventure that fed on our uncultivated need to think, and wonder. It gave many of us our first taste of cinematic possibility. In truth, the book is a link into an imaginary world where every event and consequence depends on the reader for an outcome – think of “Choose Your Own Adventure” with more literal presence. In a faraway magical place named Fantasia, the great Nothing – an unseen force sweeping over the realm and absorbing all in its destructive path – is on course to completely consume the world and its inhabitants. Only a young adventurer named Atreyu (Noah Hathaway) may hold the key to saving what remains, and at the key juncture of the story he is asked by Fantasia’s kingdom to find and neutralize the corruption, and then find a way to restore health to a very ailing empress. And a medallion gifted to the young warrior inevitably guides him on his perilous journey, acting as an amulet of protection against potential dangers he might face. The menagerie of colorful characters is fitting for the scope of the material. There’s Morla, an ancient turtle who speaks in slow, thoughtful passages; Engywook, a gnome-ish old man whose telescope may reveal a secret passage to help Atreyu escalate his journey; Falkor, a white luck dragon with big vivid eyes and a thoughtful expression of optimism; and Gmork, a wolf with a dark agenda who hides in shadows waiting for the right moment to drastically alter the course of events shaping Fantasia. That these creations all stem from another source material – namely, a book from 1979 written by Michael Ende – is knowledge I was taken aback by early on. The scope of the characterizations, and the degree of effect they are utilized is constant with the ambitious nature of the directing. In ways, they are lives that seem explicitly made for a movie screen. The questing and swords/sorcery aspect of the narrative is congruent with all standard fantasy, and yet there are augmented paradox implications. Consider a scene in which the Atreyu character stares into a pool and sees an image of Bastian reading the book he is housed in, or another when, in a moment of urgency, the realm’s child empress calls out his name in hopes that he will save them from obliteration. The engagement that the screenplay requires of Bastian in the role of a reader is more a less the blatant expression of the deepest desires buried within young bookworms, which is to be so engaged by their stories that they feel involved as if standing side to side with the heroes. Here is a movie that not only underscores the notion, but envelops the concept in a resonating adventure that exploits its interactive nature to boundless heights. 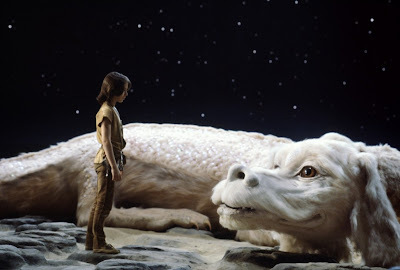 I saw “The NeverEnding Story” for the first time when I was six years old, and was not only marveled by the high-reaching arc of fantastical possibility, but also by the vivid characterizations and spirited visuals. Seeing the movie twenty years later, I was less captivated by the spectacle but more appreciative of the creative thrust that emerges from its core narrative values. Though my familiarity with the original novel remains unfilled, the themes that resonate are clear: Ende obviously saw his fable as an allegory to the slow demise of literary influence in a pop culture raised on video games and synthetic television programming, and the concept of a fantasy world devoured by a void is a declaration to how good stories rely on a faith that comes from within the enthusiasm of readers. Wolfgang Peterson would go on to inevitably make more great films, including “Outbreak” and “Air Force One,” but the vision of this idea leaves behind a lasting impression that eclipses even those. Seldom did movies like this in those days so clearly blast into the stars, much less reach for the sky. Just as it causes lasting effect on an admirer two decades after it was first seen, I suspect the film will always have an audience as long as new generations continue to have a desire for the wonders of the written word over the sound and fury that saturates our culture. Author’s Note: This review is one in a series of unfinished works saved from over the years that is now being completed and published. More will follow in the coming weeks.